Photodynamic therapy (PDT) was the first treatment for some cases of the wet form of age-related macular degeneration that provided hope of improvement of vision with treatment. It involves injecting a light-sensitive chemical into the arm. The chemical travels to abnormal blood vessels in the retina where it is activated with a special light. The activated chemical destroys the abnormal blood vessels without causing damage to the normal retinal tissues nearby. This allows PDT to be used in some cases where conventional laser treatment would cause too much damage to surrounding retinal tissue. PDT can slow the loss of vision and sometimes improve vision. Now there are drugs available that, when appropriate, can be injected into the vitreous cavity of the eye to stabilize or even improve the vision in patients with macular degeneration. Studies have revealed they provide a greater benefit than PDT. This class of medication is referred to as Anti-VEGF Therapy and includes both Lucentis and Avastin. Following treatments, some patients experience a temporary reduction of vision, which will improve over the next few weeks. This is a relatively new procedure. Serious complications with Anti-VEGF Therapy are extremely rare, but like any medical procedure, it does have some risks. 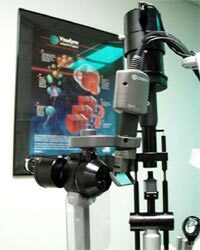 The greatest concern in any patient with macular degeneration is continued progression of retinal damage with additional loss of vision. The doctors of Karlik Ophthalmology will determine when Anti-VEGF Therapy is indicated. However, it is vital that all patients with macular degeneration monitor their vision for any change from baseline (with use of an Amsler Grid) and report any change immediately to the office of Karlik Ophthalmology.